Last night I stumbled across a new computer game, Dear Esther, released only last week (14 February) on Steam for GBP £6.99, that has me captivated all day. I can’t stop thinking about its haunting beauty, its simplicity. “A deserted island…a lost man…memories of a fatal crash…a book written by a dying explorer.” Two years in the making, the highly anticipated Indie remake of the cult mod Dear Esther arrives on PC. 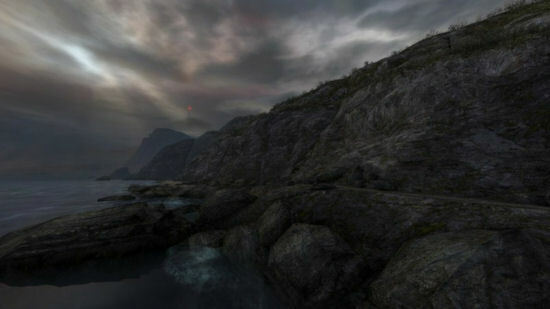 Dear Esther immerses you in a stunningly realised world, a remote and desolate island somewhere in the outer Hebrides. A scene from Dear Esther, on the shoreline with the beacon in the distance. I’m not a prolific computer games’ player. I have a handful of titles: LEGO Star Wars 1 and 2, Star Wars Battlefront 1 and 2, Battlefield 2, Bad Company 2and some of the later Call of Duty games: Modern Warfare, MW2 and Black Ops. The more hostile titles I like for the cinematic experience—it’s like seeing a film but you get to control the main characters. I never play them online, I don’t like the idea of trying to ‘kill’ the characters of other humans. I prefer to challenge the computer instead. It’s a fine line, I know, but its a line I chose to draw and stand by. Dear Esther has none of that. The main character—the only character—in the game walks everywhere. No running, jumping or climbing trees. No weapons. No picking up items. Just looking. And yet it’s the most beautiful, most cinematic, most immersive game I’ve ever seen. In my opinion it has more than achieved its vision. Not only is the artwork breath-taking, the music (by Jessica Curry) is gorgeous, and the in-game narration (by Nigel Carrington) is sublime. Dear Esther was created by Dan Pinchbeck, listed as Writer and Producer, a researcher based at the University of Portsmouth as part of a project funded by the Arts & Humanities Research Council to explore experimental game play and storytelling. Which is where some of the controversy lies. Many are claiming that Dear Esther isn’t a computer game, that it is rather an interactive story or simply art. Whatever it is I think it’s beautiful and mournful and intriguing. I can’t wait to start playing it for myself.